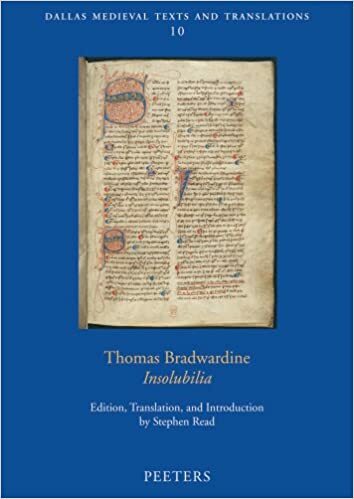 I recently interviewed Stephen Read on Thomas Bradwardine’s solution to the Liar and Read rehearsed Bradwardine’s argument step-by-step. Since the specifics of the argument can be hard to follow (but also rather ingenious), I decided to try writing out a simplified version of the argument. I kept in a tiny bit of symbolism, for ease of presentation, but am not assuming familiarity with formal logic. I include reference and links to logical principles where they are invoked unless they are fairly obvious and intuitive (eg, double negation elimination). My intention was to make the argument as short and accessible as possible without sacrificing accuracy. You can, of course, also find more thorough reconstructions of the argument at the Stanford Encyclopedia of Philosophy, in Stephen Read’s paper, and in Bradwardine’s book itself. It should be said: Bradwardine assumes that a statement is true if and only if everything it says is the case. The crucial move uses Bradwardine’s principle of “closure”: that all statements implicitly say everything that follows from the supposition that what they say is the case. ~ means “not” and T<L> means “L is true”. Case 1: Suppose the Liar (L) says only that it itself is not true. It is therefore not the case that L says only that it itself is not true (because if that were so, it would also mean that it’s true, contradicting the premise that it only says that it’s not true). Case 2: Suppose L says that it itself is not true and that something else, p.
Suppose p (as L says). Conclusion: L says both that it is true and that it is not true, and is therefore not true. Furthermore, from the fact that it is not true it does not follow that it is also true. This is because we could only infer its truth by showing both that it is not true and p. Its being not true, alone, is insufficient to entail that it is true. The way back to “true” is thereby blocked and we no longer have a paradox – merely a false statement.